Lucky Labrador Brew Pub on Hawthorne was once a favorite landing spot. This goes back to the early days of the Pub, which opened in 1994. 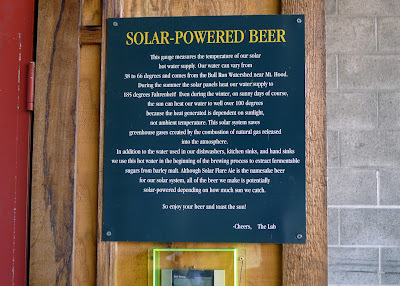 There weren't that many places you could get a craft beer in those days and the Lab was likely the only place we could take our knucklehead Labs and enjoy a decent beer. Not to mention Dogtoberfest. Lucky Lab beers were usually decent, seldom great. It was more about ambiance, I suppose. Over the years, as more and more places closer to home opened...places like Laurelwood, Alameda and others...we eventually stayed closer to home. And, yeah, our own knuckleheads were usually left at home...poor pumpkins. One thing you cannot do in the current beer climate is assume any brewery is frozen in time. The trend toward innovation and experimentation has infiltrated virtually everyone...with increasingly positive results. We've moved far beyond the days when your typical Oregon brewery produced a basic list of standard beers, along with a few known seasonals. 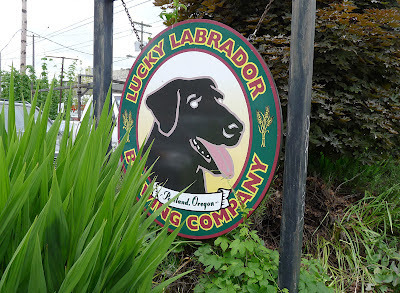 And so it is with Lucky Labrador Brewing. 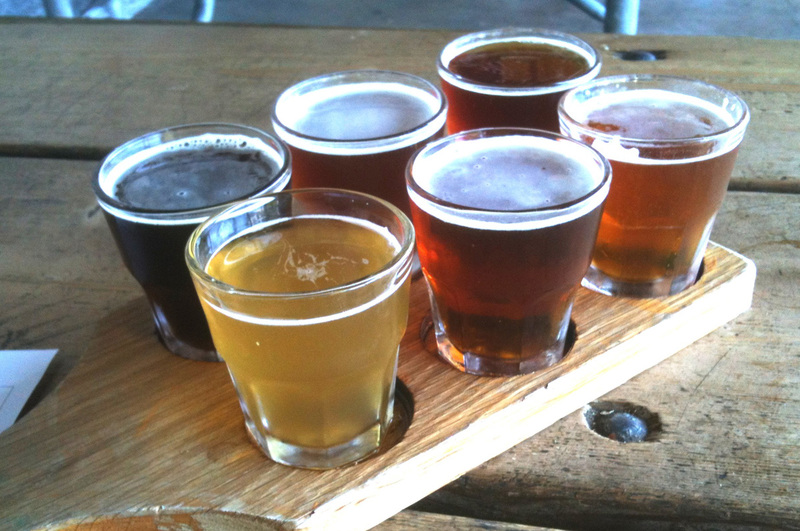 I stopped in the other day midway through a bike ride to check on the current beer offerings. They had 11 house beers on standard draft, one on nitro, another on cask, plus a cider and a guest tap. Some of the beers were familiar...Super Dog, Triple Threat IPA, Hawthorne's Best Bitter, Stumptown Porter, Crazy Ludwig's Alt, Black Lab Stout. Several beers I didn't recognize...and I'll get to them. My most recent recollection of Super Dog was of a fairly bitter, out-of-balance beer. Not so this time around. The beer wasn't as bitter and had a nice grapefruit/citrus aroma and flavor. I'm forced to assume the recipe has been modified to accommodate the growing popularity of IPAs that feature those characteristics...Boneyard RPM and Gigantic IPA come instantly to mind, but they aren't alone. Widmer's Captain Shaddock is in the same boat...so to speak. The other standards on my taster tray were Hawthorne's Best Bitter and the Alt. I've always liked HBB going back to the early days. It's a nicely balanced beer, certainly not remotely bitter by modern IPA standards. The Alt is another well-executed beer with good flavor and substance. At this point in my excursion, the Lab was batting 1.000. Go figure. Moving on to the seasonal or specialty beers, there was an Amber of middling character. Fine. Then I arrived at Black Sheep CDA. I appreciate the appropriate naming nuance...much better than black IPA, thank you. I was pleasantly surprised by this beer. Just the right amount of toasty flavor upfront and mildly bitter in the finish. Great CDA! This is one I could come back for. The best I'm saving for last, although it wasn't the first beer I tasted. They call it Bavarian Crystal Weizen. It's a wheat beer that's cold conditioned, causing the suspended yeast to drop out of solution. Lab brewers used a Bavarian yeast strain for this beer. They say it magnifies notes of banana, clove and vanilla. I found the beer light, crisp and slightly tart. At 3.3% ABV, I probably could have had a few of these. But another tasting mission beckoned. It may be time to reconsider the Lab. The beers have improved in my estimation. I can't comment on the food, always mediocre in my memory, because I invested in peanuts. But you can't ignore the beers, the dog-friendly patio or the cavernous, user-friendly interior. The ambiance has always been good here. There's also an environmental angle, if you weren't aware. 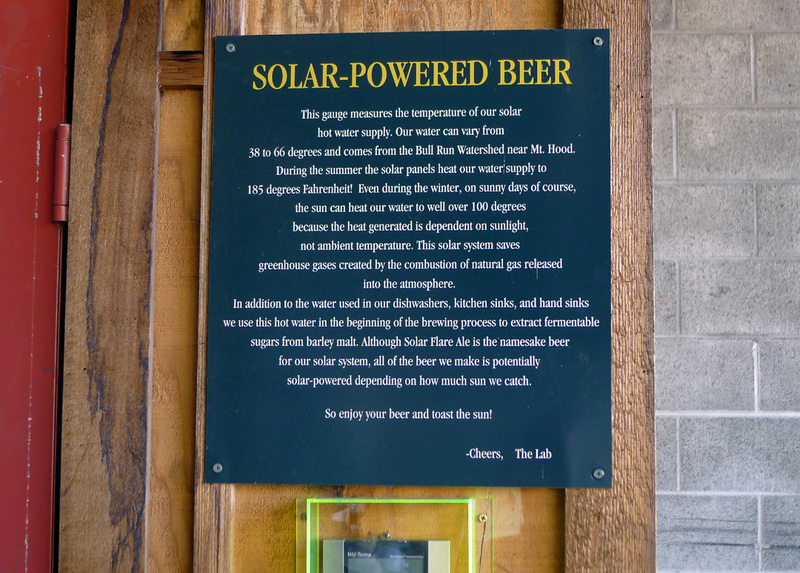 The Lab has an array of solar collectors on the roof and uses the captured energy to heat water for brewing. Solar Flare Pale honors the solar connection (it wasn't on tap when I stopped in). Under normal circumstances, the work of heating water for brewing would be done by natural gas or electricity...which have greenhouse gas components. Nice thinking, guys. I enjoy reading your posts. Keep up the good work! I am in complete agreement with you McMenamin's. I wrote them off long ago. When I visited the Hillsdale Pub a short while back, I was impressed with what I found. My view is that everyone is being forced to turn their game up a notch or two. I'm including Widmer, Pyramid and Bridgeport on that list. What's happening is a good thing. It's no longer enough to simply have craft beer; you've got to have quality craft beer that's interesting and somehow unique. Thanks for the info on the Cornelius Pass festival. 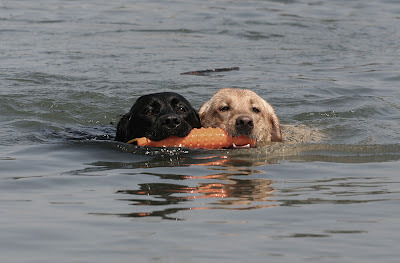 We recently rediscovered Lucky Lab as well. The north Portland location has a great selection of offerings, and one of the friendliest staffs in town. All of the beers aren't for me, but the ones I do like are solid. 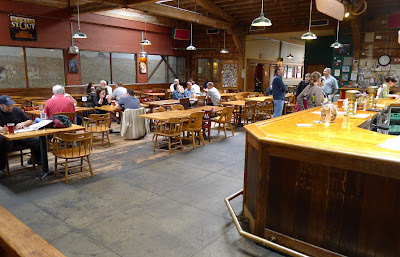 As for McMenamins, we've never given up on them. They just fall off the radar at times. Since we play Euchre with a group that meets at the SE Lab every other Tuesday, and have friends that like the NW Lab, I get there more than I probably would otherwise. As a hop head I thoroughly enjoy both Super Dog and Black Sheep. In fact, I have a hard time bringing myself to order anything but those two. The food is fine...no complaints at either location...but it's not a place you go for the food. You go for the beer, the food is secondary. Glad to hear you've given them a second chance. Kris, since I'm writing about these pubs and breweries, I feel like it's kind of my job to revisit each place from time to time and objectively report what I find. Times change...breweries, like all businesses, have their ups and downs. It seems like the Lab is on the upswing...and I salute what they're doing. Anyway, thanks for stopping by.